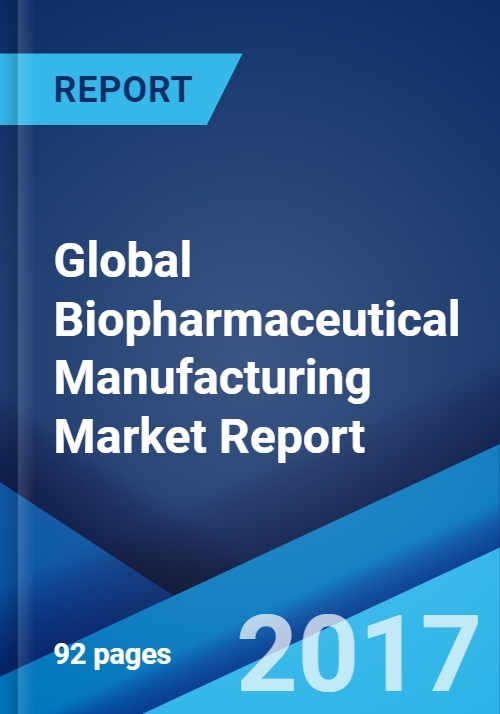 The latest report titled “Global Biopharmaceutical Manufacturing Market Report 2017-2021” provides a detailed analysis on the global biopharmaceutical manufacturing market. Biopharmaceuticals represent one of the most elegant and sophisticated achievements of modern science. Compared to small molecules which are synthesized chemically, biopharmaceuticals or biologics are manufactured from biological sources and have proved to be efficacious in the treatment of various chronic and other rare diseases for which there are no available treatments. The production of biopharmaceuticals reliably at an industrial scale, however, involves highly complex manufacturing capabilities. This involves genetically engineered living cells that must be frozen for storage, thawed without causing any damage, and made to grow in the unusual environment of a reaction vessel. The molecules once produced must then be segregated from the living cells that produced them and the media in which they were made, all without damaging their complex, fragile structures. Such production facilities are also notably more expensive and involve longer time lines to build compared to small molecule drugs. These facilities are also significantly costlier to run, involving long process durations, low yields, costly raw materials, and require a team of highly skilled experts to operate them. The efficacy and safety of biopharmaceuticals, coupled with their ability to address previously untreatable conditions, allows healthcare companies to command higher prices and margins for these drugs. Driven by their numerous advantages over conventional drugs, biopharmaceuticals today represent a big opportunity and represent more than 20% of the total global pharmaceutical sales. The current annual growth rate of biopharmaceuticals is also double that of conventional drugs, and growth is expected to remain robust for the foreseeable future. As a result of their rapid growth, many new players are entering this market and most current manufacturers are expanding their manufacturing capacities. Moreover, with the anticipated launch of a number of biosimilar drugs in the next five years, we expect a significant expansion in the global biopharmaceutical manufacturing capacity. We expect these trends to make biopharmaceutical manufacturing a very lucrative opportunity for investors and manufacturers. The global biopharmaceutical manufacturing has been categorized on the basis of cell culture which includes mammalian cell culture and microbial cell culture. Currently, the largest number of biopharmaceutical products are manufactured using mammalian cell culture. Moreover, the mammalian-cell based products are more compatible with patients as these have been shown to cause minimum adverse reactions. As a result, there has been an increase in the mammalian based products over the past several years. Currently, mammalian cell culture holds a dominating share accounting for 56% in the total biopharmaceutical cell culture market. On the other hand, a significant growth has been observed in the microbial based products as well. A strong growth in the sales of dominant drugs such as Humalog, Lantus, Neupogen, Neulasta, and Betaseron/Betaferon have sustained the growth of biopharmaceutical manufacturing market. On the basis of class, the market has been segmented as follows: Monoclonal Antibodies, Recombinant Proteins, Interferon, Granulocyte Colony-Stimulating Factor (G-CSF), Erythropoietin, Human Growth Hormones, Recombinant Human Insulin, Purified Proteins and Vaccines. Currently, Monoclonal Antibodies represents the fastest growing segment in this market. Currently, North America accounts for the largest biomanufacturing capacity followed by Europe and Asia. Technological advancements and high healthcare spending are some of the major factors that are driving the growth of the North American market. On the other hand, driven by factors such as emerging markets, increasing trends of contract manufacturing and a large patient pool, Asia will represent the fastest growing market.